Figure 1: Top-right: ISCCP low cloud cover (%) climatology for June-July-August, with the GPCI transect and the three locations used in our study (adapted from Teixeira et al. 2011). Bottom-left: schematic of cloud regimes in the tropical overturning circulations (Stevens 2005, adapted from Arakawa 1975). Large-eddy simulation (LES) of clouds can help resolve one of the most important and challenging question in climate dynamics, namely, how subtropical low clouds respond to global warming. However, earlier LES studies have generally prescribed large-scale conditions (e.g., surface temperatures) in a way that does not guarantee energy balance. We have developed an energetically consistent framework for driving LES, in which the LES domain is coupled to a simple slab ocean. In this framework, the cloud responses to global warming can be very different than in the traditional frameworks that prescribe surface temperatures. Low clouds are prevalent in the marine boundary layer (MBL) of Earth’s atmosphere. By reflecting sunlight, they strongly influence Earth’s energy budget. It is uncertain how low clouds and their effect on Earth’s energy budget change as the climate warms. In fact, uncertainties in how clouds change with warming are the primary source of the large spread in climate projections for the next century (Bony and Dufresne 2005; Vial et al. 2013; Brient and Schneider 2016). This uncertainty is attributable to the inadequate resolution of climate models for resolving the small-scale turbulent dynamics of MBL clouds. Large-eddy simulations (LES) are high-resolution fluid dynamics simulations that can resolve important components of the turbulent dynamics of MBL clouds (e.g., Matheou et al. 2011, Pressel et al. 2015). LES are computationally expensive thus limiting the size of computational domains to tens of kilometers on a side. This means that the effects of larger-scale dynamics (e.g., the Hadley and Walker circulations, the synoptic eddies, and the sea surface conditions) must be prescribed. The traditional approach is to fix the sea surface temperature (SST) and free-tropospheric conditions, which are then perturbed to mimic global warming (e.g., Rieck et al. 2012; Blossey et al. 2013). This approach has provided valuable insights into low-cloud feedback mechanisms. But the climate changes simulated in this way may not be realizable, because the surface energy budget generally is not closed. For example, following the traditional approach, the simulated increase in surface evaporation or latent heat flux (LHF) is usually 6-7% K-1 when SST are prescribed. Such large LHF increases are generally not realizable, because radiative energy flux changes are needed to evaporate the excess water. In reality, LHF increases more slowly, at a rate of around 2-3% K-1 (e.g., Held and Soden 2000, 2006; Schneider 2010). The excessive evaporation increase under warming with prescribed SST leads to an over-moistened MBL and distorted low-cloud responses to warming (e.g. Webb and Lock 2013). In Tan et al. (2016a, 2016b), we present a new framework for forcing LES that closes the surface energy balance and thus guarantees realizable changes of surface fluxes under climate change. To achieve this, we couple the LES domain to a slab ocean model, whose SST evolves according to the surface energy balance. This necessitates taking into account atmospheric radiative transfer so that any SST warming is driven by radiative changes (e.g., changes in greenhouse gas concentrations) and resultant changes in the surface fluxes. To establish the usefulness of the new framework, we simulate MBLs in three locations along the well-studied GEWEX/WGNE Pacific Cross-section Intercomparison (GPCI) transect (Teixeira et al. 2011) across the subtropical northeastern Pacific (Figure 1). The same locations were also studied in the CGILS project (Zhang et al. 2012). They are representative of typical subtropical low cloud regimes: shallow cumulus (Cu) at location S6, stratocumulus (Sc) at S12, and Sc-over-Cu at S11. In Tan et al. (2016a), we show that all three low-cloud regimes under the present climate are well simulated by both our new slab-ocean approach and the traditional fixed-SST approach. In Tan et al. (2016b), we compare how the MBL and low-cloud responses to warming differ under the two approaches. While there are some similarities between the approaches, an important difference is that the slab-ocean approach allows surface and MBL temperatures to adjust to the energetic perturbation: positive energetic forcing of the surface leads to warming, weakens the inversion, and reduces low-cloud cover and liquid water path (LWP). The latter decreases the reflection of sunlight, leading to further warming, which generally amplifies the MBL and low-cloud responses relative to what is seen with prescribed SST. The amplification is especially strong for the Sc and Sc-over-Cu clouds near their transition to Cu. With sufficient warming (around 4-8 times present CO2 concentration), Sc and Sc-over-Cu clouds collapse to Cu, implying a strong positive feedback of these low clouds on warming. The collapse of the Sc clouds occurs because, as the free-tropospheric longwave opacity increases with increased CO2 and water vapor concentrations, the turbulent mixing that is driven by cloud-top radiative cooling weakens, and therefore is unable to maintain the Sc layer. Under the new slab-ocean approach (Figure 2, the ‘OHU’ cases), the SST and MBL temperature warm abruptly by 7-10 K and the MBL deepens remarkably. In contrast, the MBL shallows or even becomes cloud-free under the traditional fixed-SST approach (Figure 2, the ‘SST’ cases). 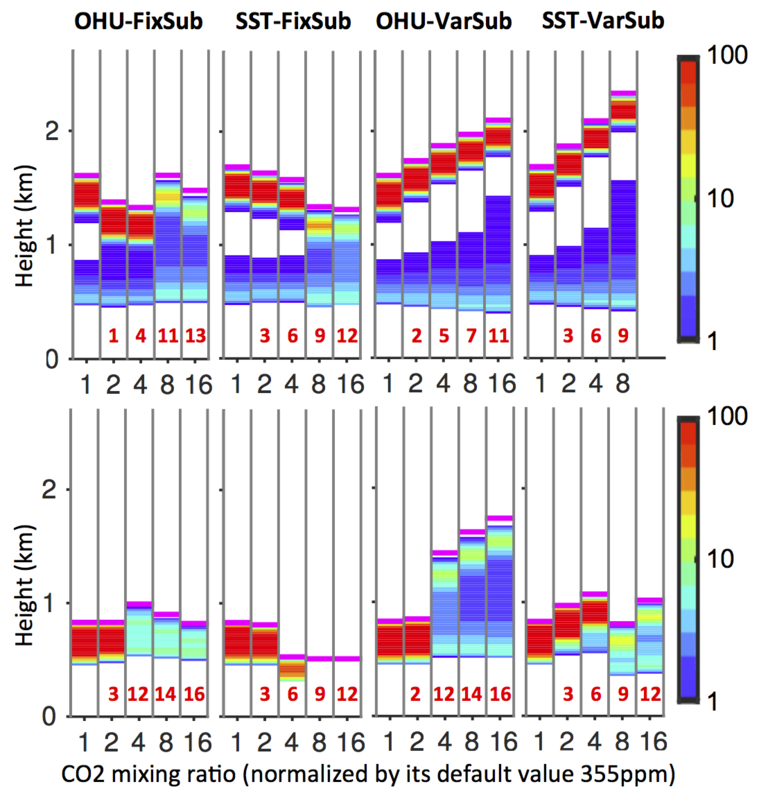 Figure 2: Statistically steady state profiles of cloud fraction (%) for (top row) S11 Sc-over-Cu cases and (bottom row) S12 Sc cases under climate change, adapted from Tan et al. (2016b). OHU: new slab-ocean approach with closed surface energy budget; SST: traditional fixed-SST approach. FixSub: unchanged large-scale subsidence; VarSub: reduced large-scale subsidence by 15% per doubling CO2. The magenta lines represent the top of MBLs. The red values represent the SST increase relative to the reference case. In each panel, temperatures increase in the columns from left to right, as the CO2 concentration increases from its reference value up to 16 times the reference value. The Cu cases also show strikingly different responses to warming with the two approaches (Figure 3). Under the traditional approach with prescribed SST, LHF strengthens strongly under warming, leading to a deeper Cu layer with decreased cloud cover, as seen in previous LES studies (Rieck et al. 2012). But such strong LHF increase is unrealistic. 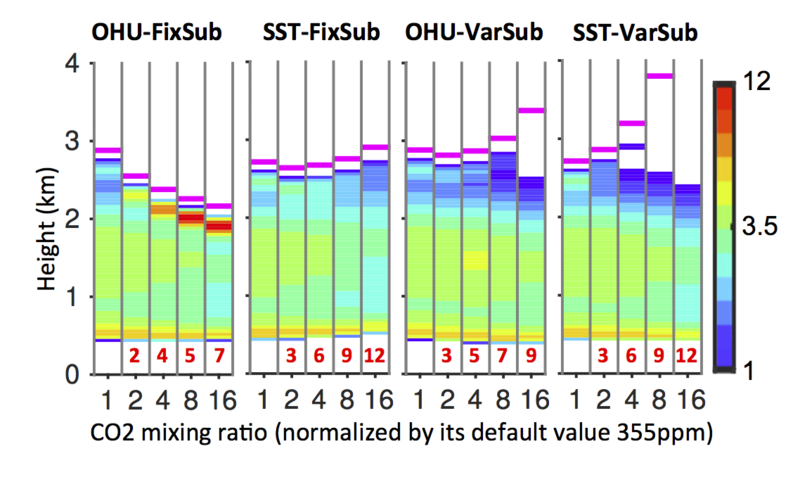 Under the new slab-ocean approach, the LHF increase is weaker under warming, the Cu layer shallows (if the large-scale subsidence rate is kept fixed), and the inversion strengthens. These effects add up to a more weakly positive low-cloud feedback on warming. If the large-scale subsidence weakens under warming, the difference between the two approaches is less pronounced, because of a fortuitous compensation between the subsidence and surface energy balance effects on the MBL dynamics. Figure 3: Same as Figure 2, but for the S6 Cu cases, adapted from Tan et al. (2016b). In summary, the LES framework with closed surface energy balance constrains the change in surface fluxes and especially LHF to be consistent with the radiative forcing, which is important for obtaining realizable MBL and low-cloud responses to warming. It also features an SST-cloud cover feedback that amplifies the cloud response, most strongly when cloud regime transitions (e.g., from Sc to Cu) occur. Traditional ways of driving LES with prescribed SST miss these effects, leading to their distorted responses to warming. In climate change experiments with our LES framework, the Cu regime shows a modest positive shortwave feedback under warming, while the Sc and Sc-over-Cu regimes both show strong but state-dependent positive shortwave feedbacks, with a possible break-up of Sc layers in very warm climates. The cloud responses are somewhat sensitive to changes in the large-scale forcing, such as subsidence. Therefore, incorporating large-scale dynamical factors, for example, from GCMs will help further constrain the MBL and low-cloud responses to warming.